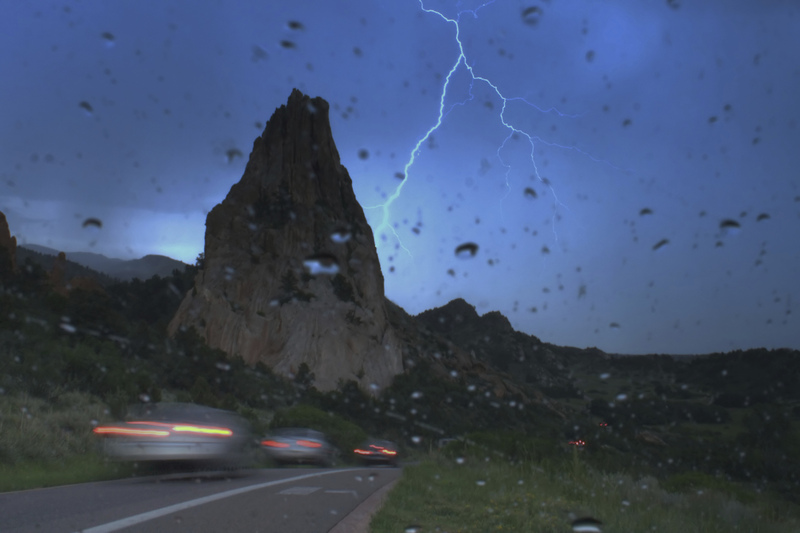 What Should I Do If I’m Driving in a Thunder or Lightning Storm? Fact or myth: Your rubber tires will stop lightning from striking your car. If you answered “myth”, you’re correct! Many people believe that rubber tires will protect them while driving through a lightning storm, but this is not the case. Surprisingly, it is your car’s metal body that could offer a level of protection. If you’re caught in a storm while driving, you are safest in an enclosed, metal vehicle. (This means hard-topped cars with all of the windows shut.) If your car is struck by lightning, the current will flow through the metal body of the vehicle to the ground. Open and soft-topped vehicles (e.g., Jeeps, convertibles) will not provide as much protection. For this reason, try to avoid driving in an open or soft-topped vehicle if you know a storm is coming. Heavy rain caused by storms can reduce your visibility and create dangerous road conditions. If possible, pull off at the nearest exit and find shelter. If there is no shelter around and you must stay on the road, pull over, turn off your engine, and turn on your hazard lights while you wait out the storm. Do not touch anything metal inside of your car. This includes the radio, cell phone chargers, mobile GPS devices, door handles, and the steering wheel. Staying away from metal objects can help keep you safe if lightning strikes your car. If you’re on a motorcycle or a bicycle, do not seek shelter underneath trees. While trees may provide cover from the rain, this will greatly increase your risk of being struck by lightning.